No one in the world has a better view of Portland Trail Blazer basketball home games than George Fox alumnus Dan Hyatt (G87). While he doesn’t have courtside seats, Hyatt does have at his fingertips up to 20 instantaneous views of all the action and the reactions of the coaches, players and more than 20,000 fans inside the Moda Center. Hyatt is producer for the pregame, postgame and halftime shows for the Blazers organization, hired in September by Blazers Broadcasting. And, he’s already been re-signed for next season. During Blazer games Hyatt is located in the “High Post” room next to the team locker room. He watches the monitors as they show the views of seven to 17 cameras, including four that are robotic. He chooses what will air at halftime and immediately following the game, coordinating a dozen employees that include personnel for audio, graphics, camera operation, video replay and technical direction. On a typical 14-hour game day Hyatt starts working at home by 8 a.m., researching, following Twitter chatter, and compiling stats, stories and other team information before outlining the pregame show. He arrives at the Moda Center about seven hours before game time and assigns his crew pre-production work. Then, an hour ahead of tip-off, he meets with announcers for a rehearsal. During the game, Hyatt and crew rapidly select highlights and features for the halftime and postgame shows. Back home, often after 10 p.m., he unwinds by snacking, watching TV and gathering ideas for the next game. 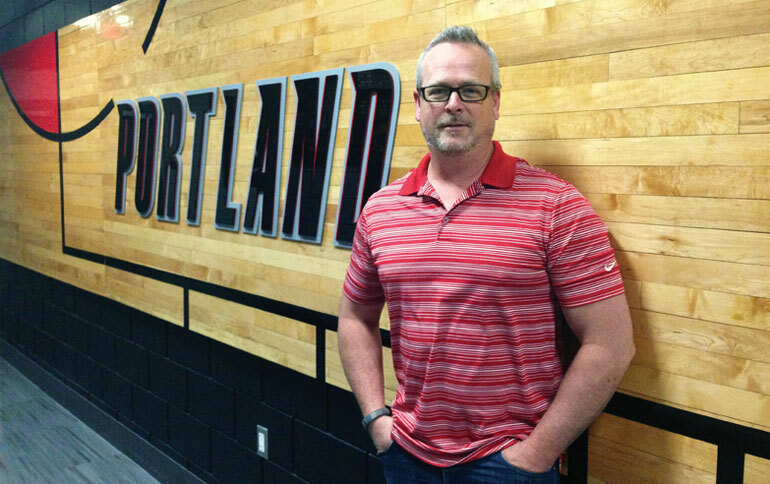 As founder and owner of Red.E Media, started in 2004, Hyatt spends non-Blazer time with clients that include Nike, ESPN, NBC Sports, CBS Sports, Fox Sports Net, Fox Sports World, TNT Sports, Comcast SportsNet and the Portland Timbers, for whom in May he covered their Los Angeles games at home and on the road. With Nike he is show director for internal events for employees and guests, which included a production in Brazil last summer.